“Quelle journée!” That was how Jeff messaged me on Monday evening. Safe to say things didn’t go exactly to plan, nor did Plan B work so it was Plan C in the end. What am I talking about? Let me explain a day which shows how impromptu thinking is important. Plan A was straightforward and, maybe, things had gone too smoothly up till then. 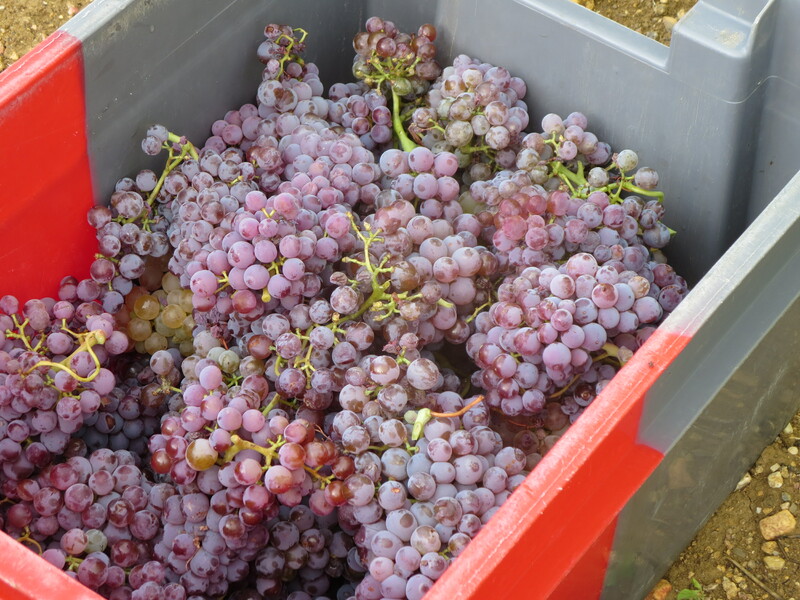 I wrote recently how the team was in the groove and the grapes were being harvested efficiently. 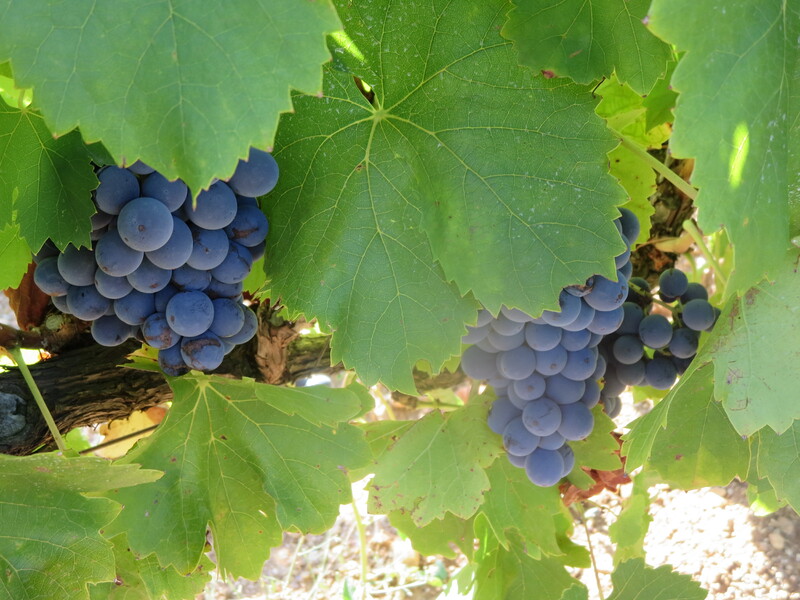 Monday was the day for the Mourvèdre to be picked, a real star of the 2016 crop, hopes were high for a repeat. Everything began well. 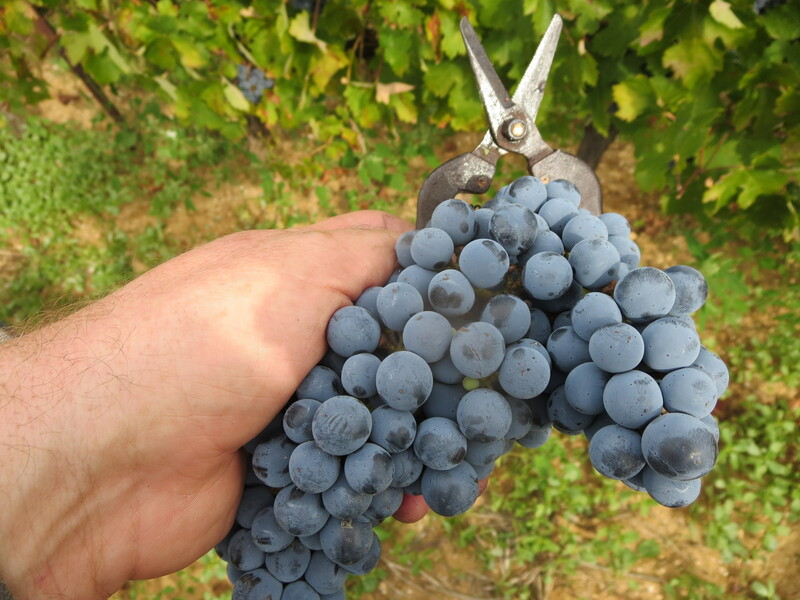 A silvery dawn revealed grapes in tip top condition though smaller yields in keeping with the vintage. The first cases arrived and I was sorting through them with Matthieu, a trainee sommelier on work placement. And then the destemmer (érafloir) suddenly stopped. On opening the main body Jeff found the fan belt off and one of the wheels sheered away. No easy fix. 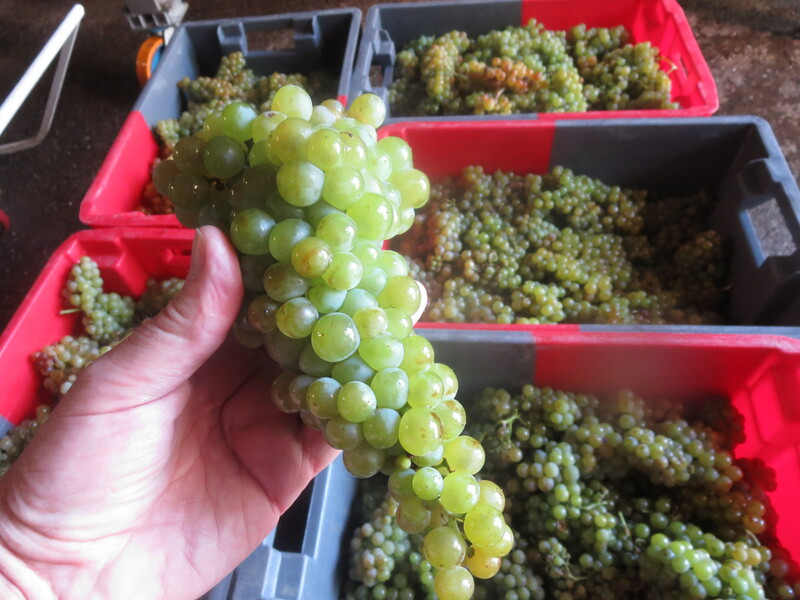 We had already destemmed 20 cases or so and the grapes were in stainless steel tank. With no érafloir, however, we could not destem. 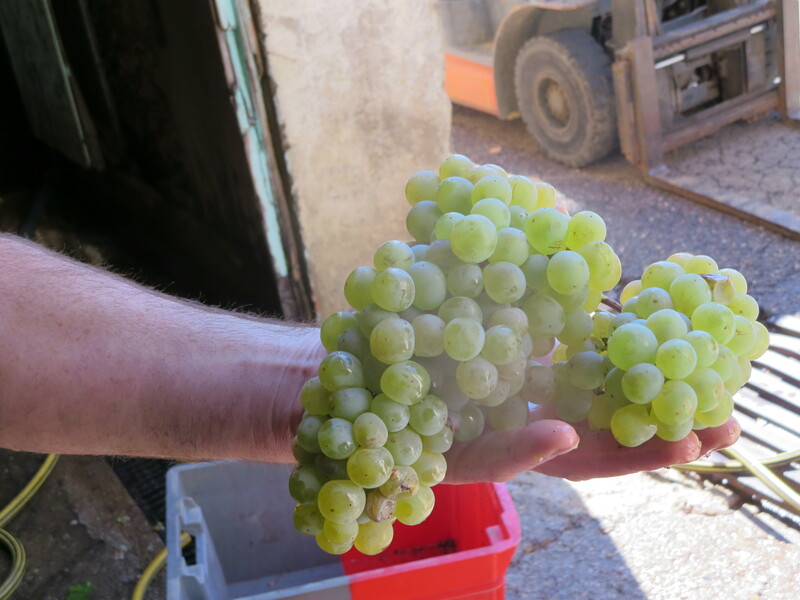 Jeff declared that we would have to move to whole bunches. We moved upstairs to the new mezzanine floor created in the cellar renovations of the last two years. Trapdoors in the floor are positioned above the tanks and big plastic chutes are connected so that the bunches can fall through into the tank. The cases are brought by Michel to the upper floor via the garden and then sorted just as carefully. 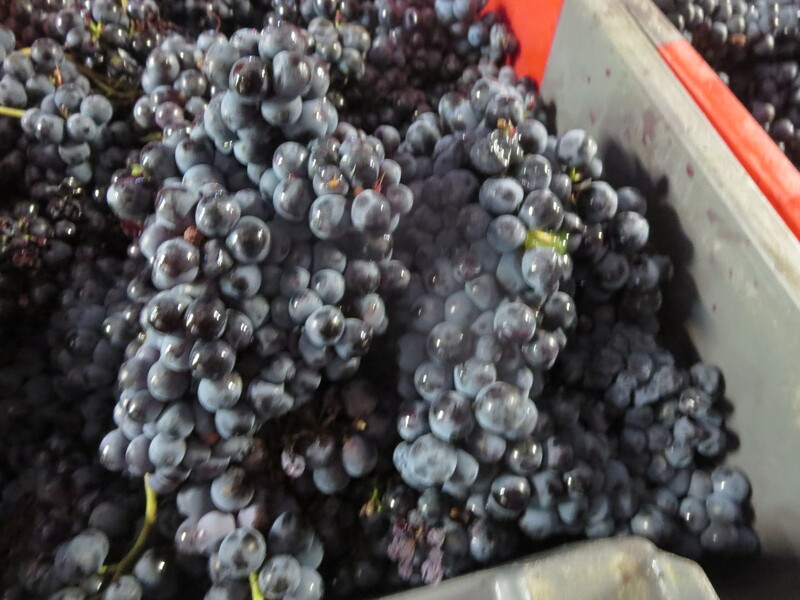 The tank was now filled with destemmed bunches and lots of juice but also whole bunches in amongst that. This was Plan B. A neighbour then offered the use of his destemmer which was brought down and put in place whilst Plan B was working. We started this and did a few cases of destemming again but it was a big machine, meant for huge quantities of grapes and was too powerful for the amount we were processing. Lunchtime. Reflection. Back to Plan B, whole bunches. Meanwhile Jeff took the original destemmer to the repairers who declared it unrepairable! However, these were the same people who had renovated the cellar and they kindly offered Jeff the use of a third érafloir. Plan C. This proved just the job, even quieter and more efficient than the original. 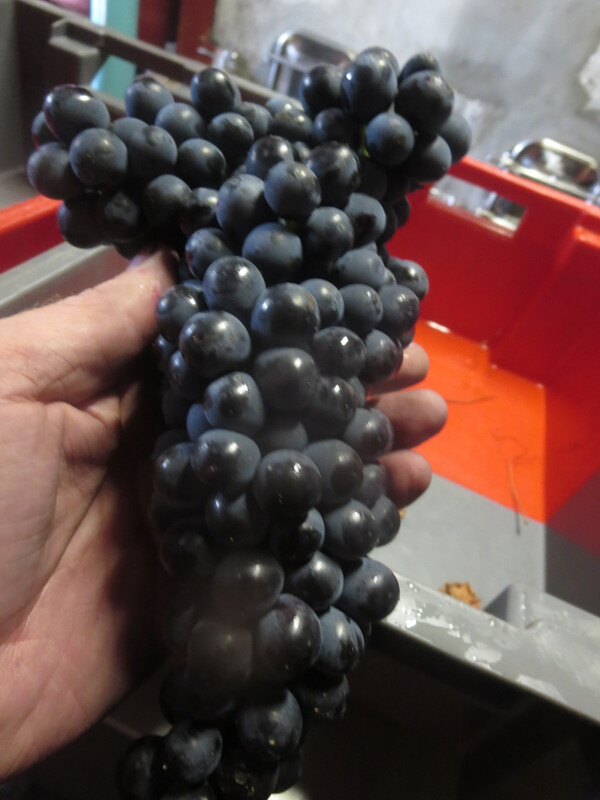 So, we have an interesting tank of Mourvèdre, a millefeuille of grapes, juice and stems. 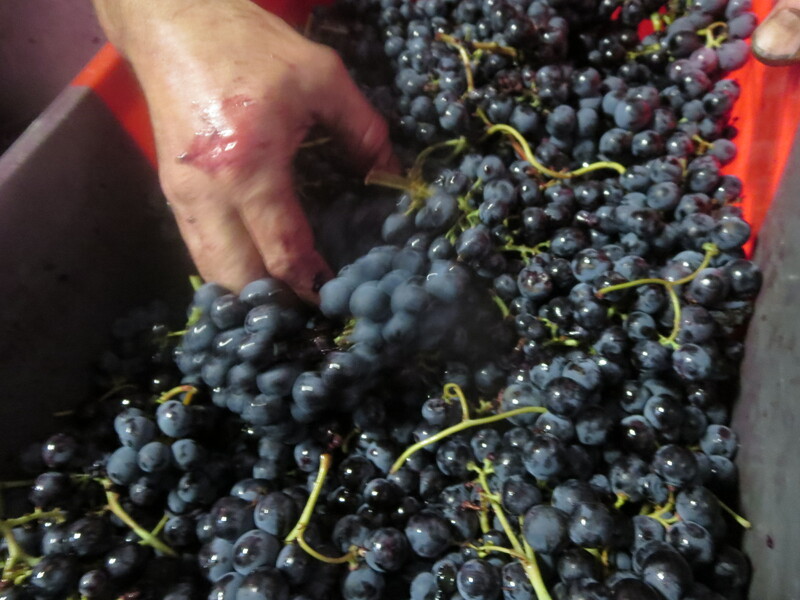 No doubt it will still produce very good wine as the grapes were healthy and of very good quality. However, it had been a day to try Jeff’s patience whilst other tanks also demanded his attention. He had also damaged one of the large tubes used for pumping the grapes and juice first thing, I think a black cat must have crossed his path on the walk to the cellar that morning! All’s well that ends well however, but it was certainly proof that you need to have contingencies and how experience can help a vigneron to overcome adversity. Categories: Vignerons, Vines, Wines | Tags: érafloir, destemmer, Mourvedre, Whole bunch | Permalink.